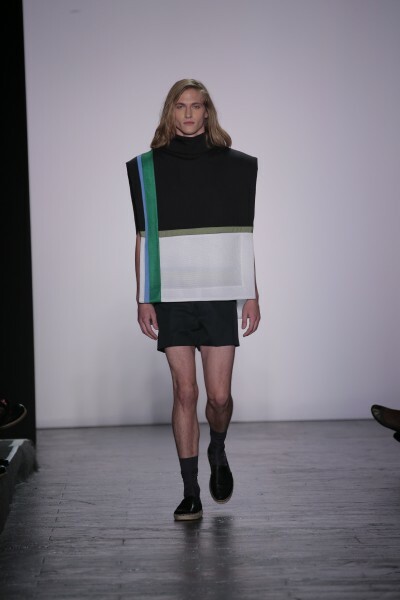 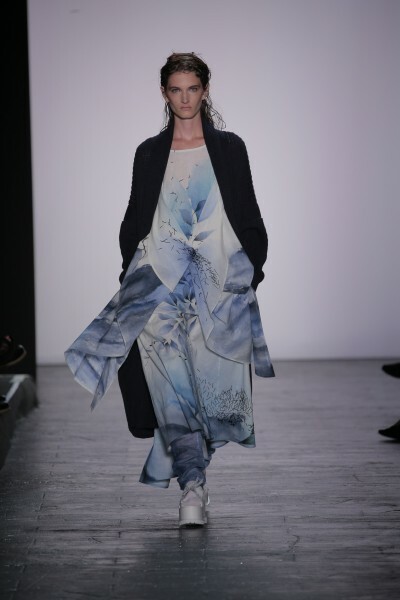 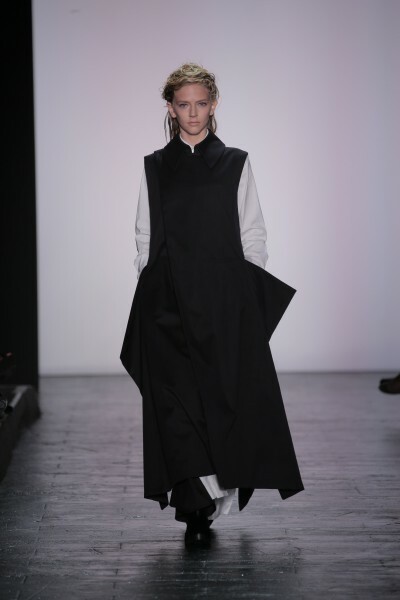 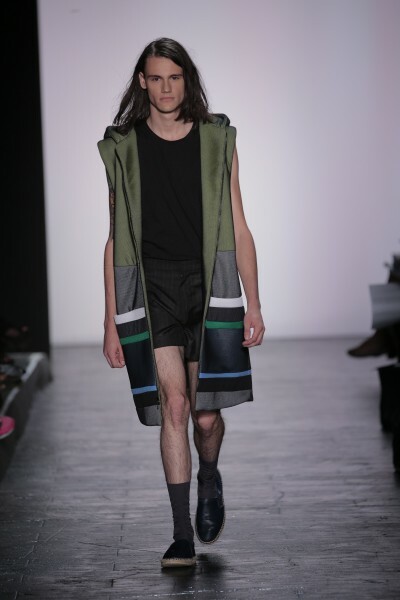 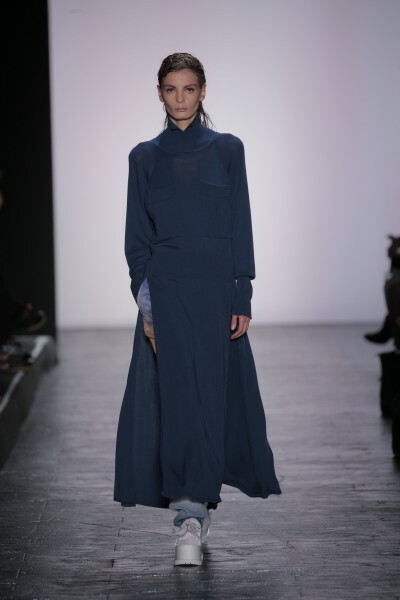 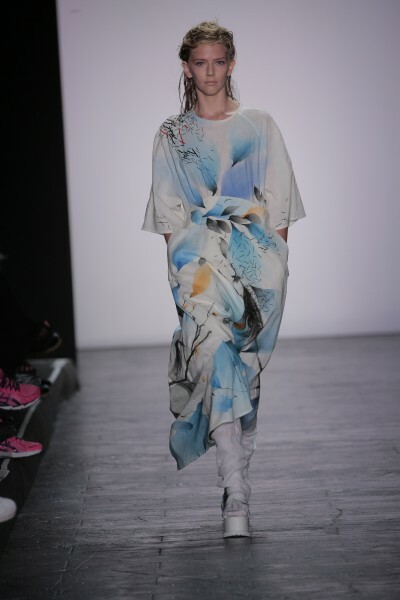 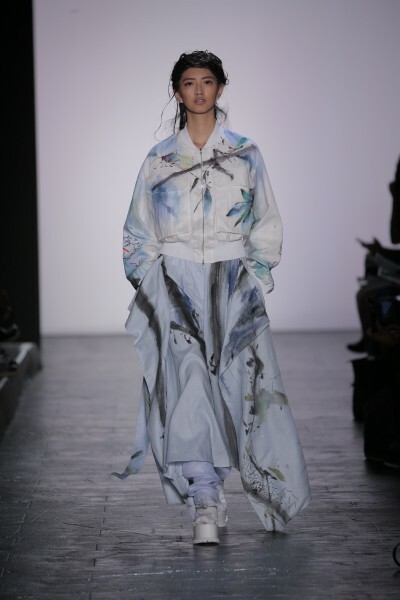 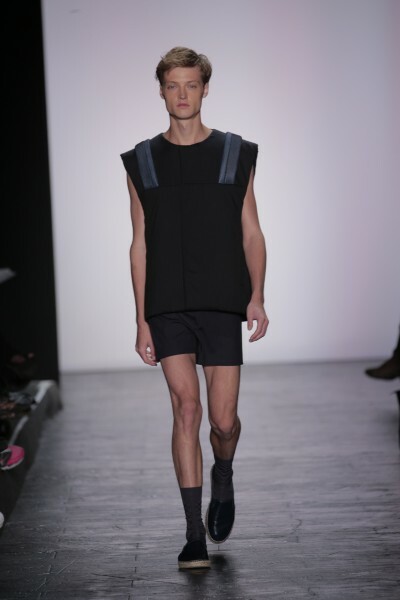 The San Francisco-based Academy of Art University featured eight student designers in its Spring 2016 collective at New York Fashion Week. 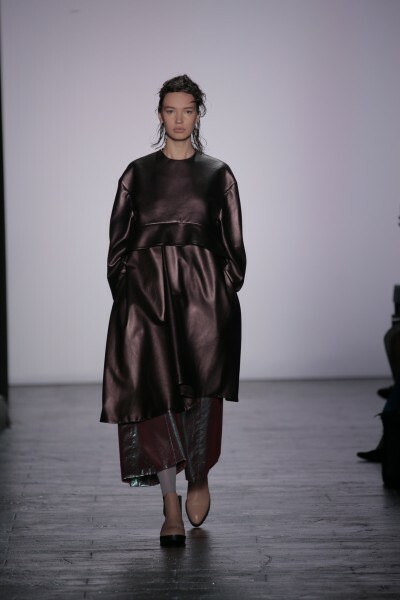 Max Lu and Jingci Jessie Wang successfully combined leather pieces in metallic silver, pink and mauve tones with lame and sequins. 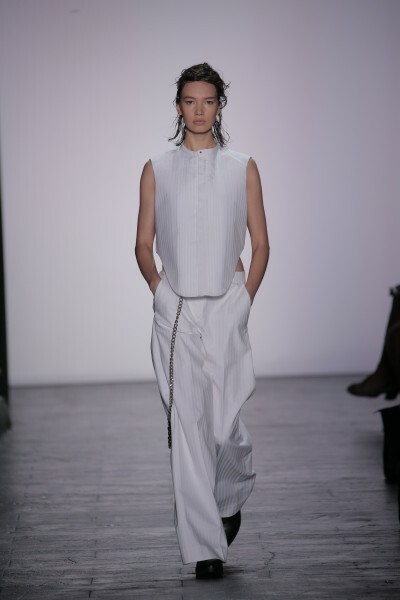 Many of the looks can be worn in the evening, but also easily as separates to tone down the overall shine. 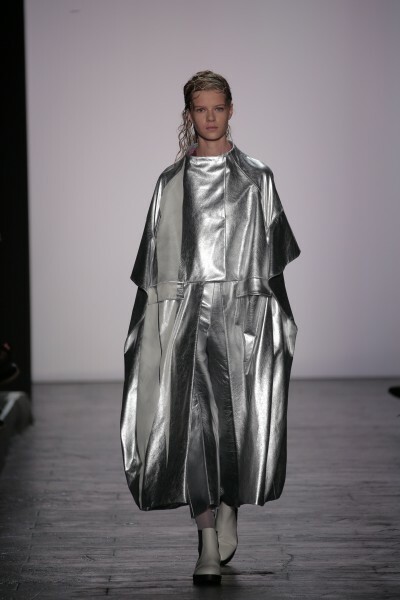 Beautifully and gracefully draped, a couple of highlights included a silver metallic leather shell paired with purple-pink leather pleated pants, and a metallic silver dress coat with elbow-length bell sleeves. 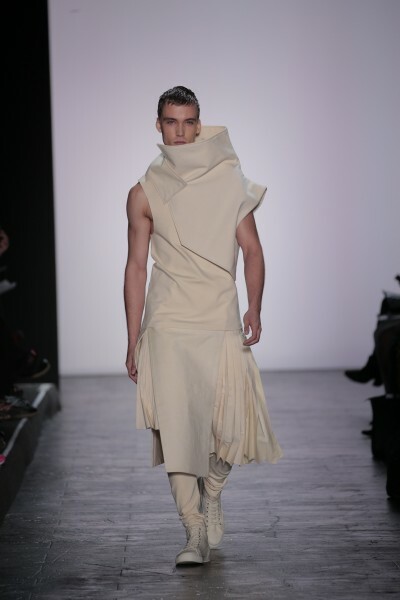 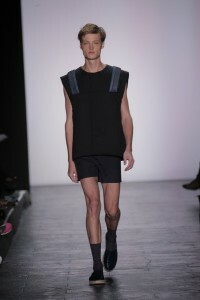 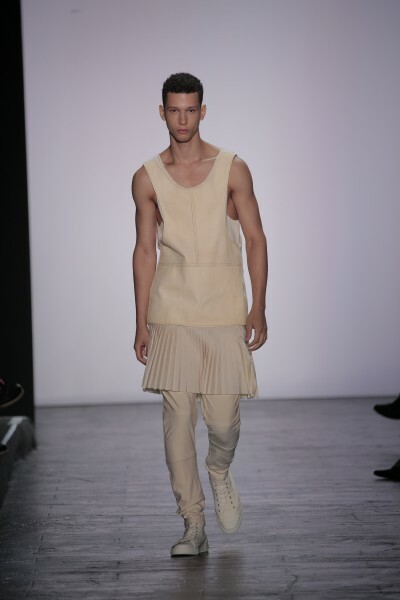 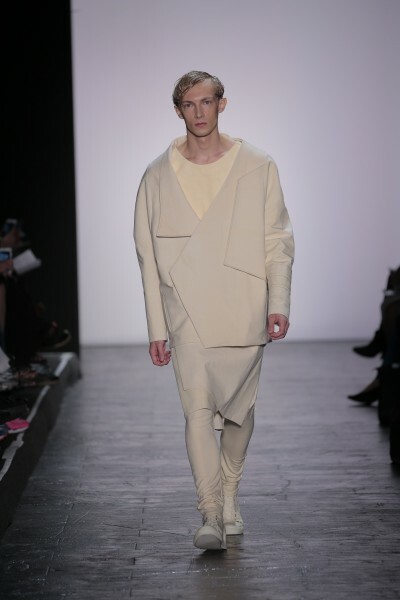 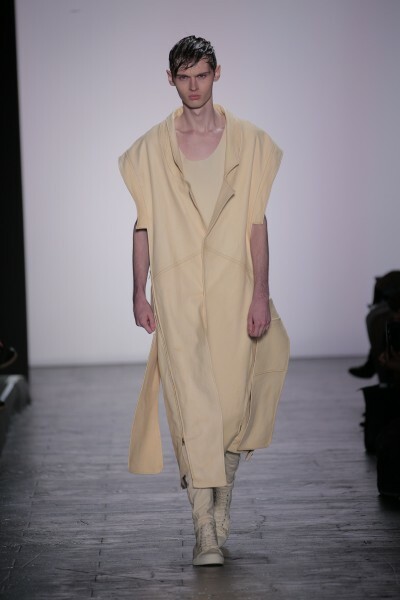 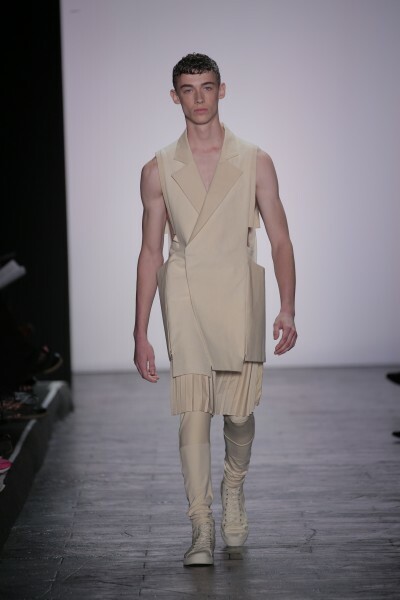 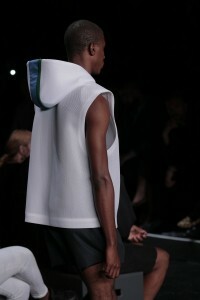 Ruone Yan’s capsule collection included Venus flytrap-inspired origami “cocoons” for men. 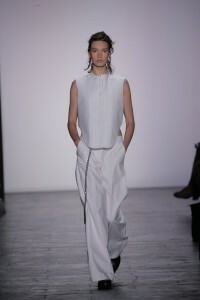 All-cream ensembles were thoughtfully layered with leggings and skirts. 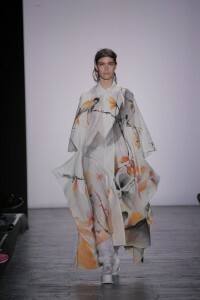 Combining the separates with different colors would soften the theatrical nature of the collection, but still highlight the sculptured pieces. 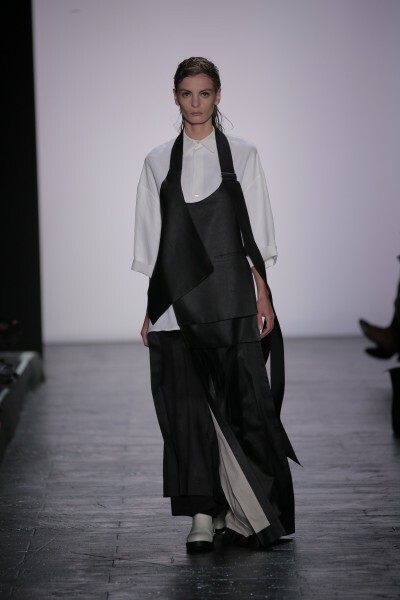 The leather vest, paired with a pleated skirt, could easily be worn by a woman too. 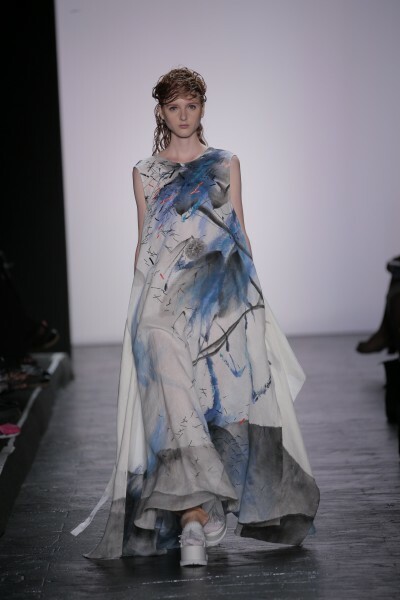 These pieces can stand up on their own, but worn together, make a more dramatic statement. Liz Li and Bom Kim and created serene prints inspired by “abstract art and freehand brushwork.” Their opening look, a long cardigan paired with a blue flower and abstract water design – layered with a linen dress and matching leggings – was a standout, in addition to the linen dress with the scenic, abstract pattern in black and blue. Everything is perfectly wearable and interchangeable, but it’s the patterned pieces that most women will aim to get their hands on. 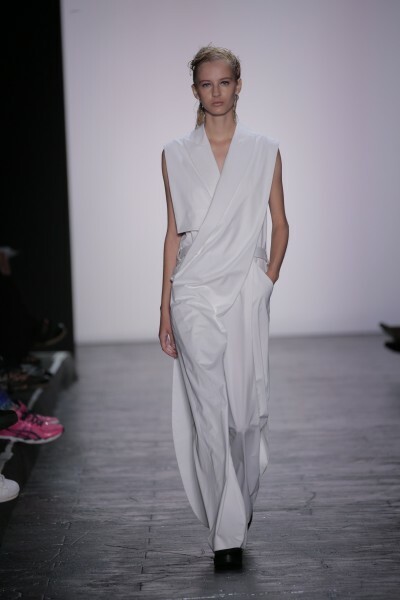 Mehrzad Hemati’s all-white collection comprised simple clean lines. A sleeveless cotton dress has a criss cross tuxedo lapel and asymmetric hem. 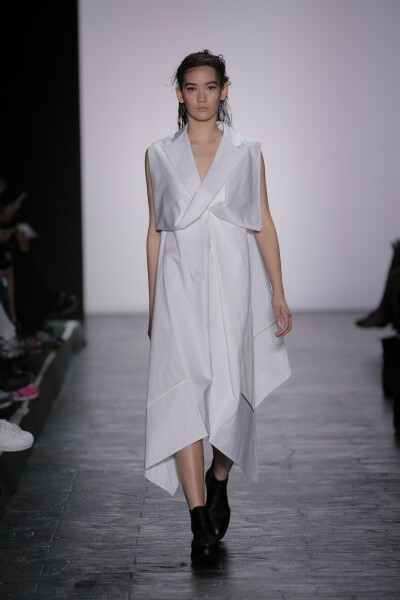 The standard jumpsuit is introduced to us in a long wraparound vest over pants. 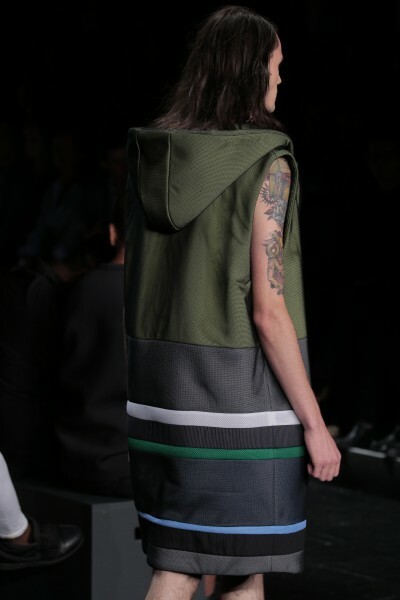 This collection is full of easy-to-wear pieces that are interesting enough to separate from the pack. 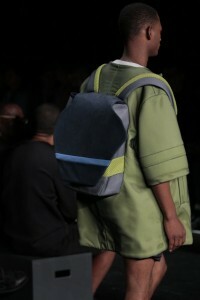 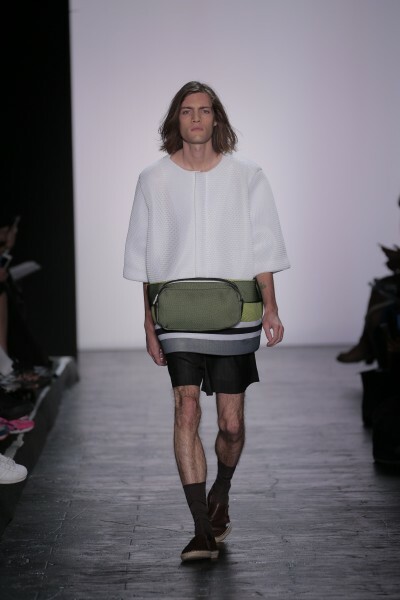 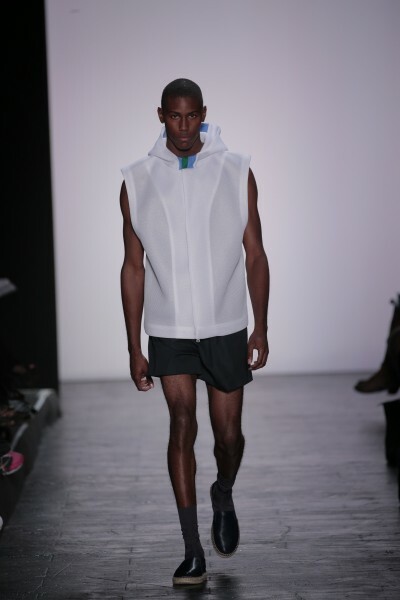 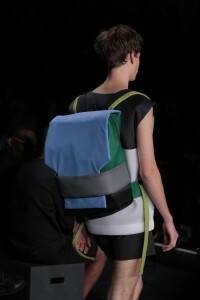 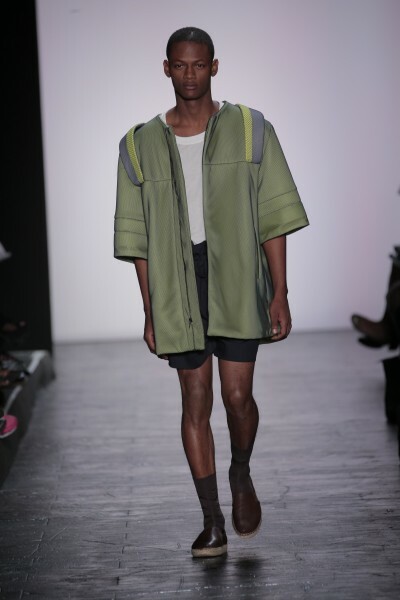 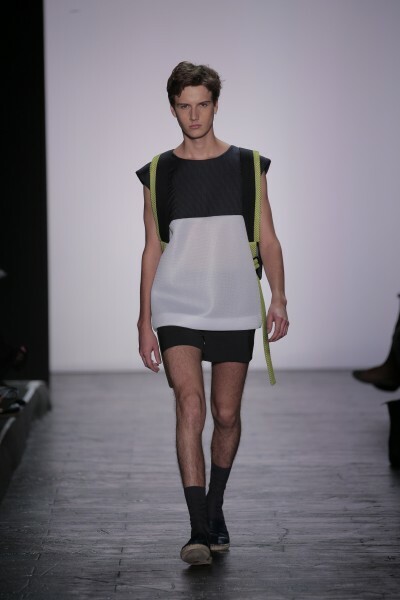 Livia Bianda’s sportswear influenced collection in strange boxy, “exaggerated silhouettes” bordered on cartoon-like, but had a practical element of a backpack or fanny pack attached. 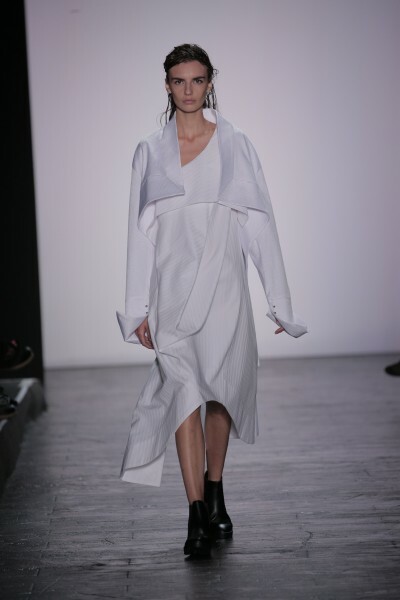 Some of the pieces could be worn with more basic layers to balance out the puffiness, but many of them are simply too dramatic to pull off, even on their own. 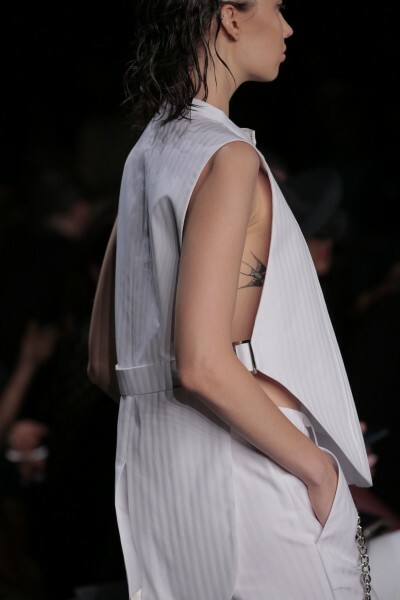 Wenhan Yu designed a nicely contrasting, stark white and black collection as evidenced by the back view of some of the outfits. Aprons, an unusual cut to incorporate, were used as layering pieces, adding interest to the long, loose silhouettes. Yu proved that one can still look elegant without having to expose too much skin or wear skintight pieces.